"Dare to be Great" should be the title of this book. Bel Canto = "Giro Vocal Motion Technique" above All others!! - for the real Singer who is intent on having complete and perfect use of his vocal instrument for a lifetime - insuring a voice that is free from force and strain, a voice that responds to every thought and a process that will grow and grow without limit, never ruining, hurting or stressing the instrument. Everything is explained without holding back anything - the three previous editions of the "Voice" are expanded here to include the vocal secrets of the greatest singers combining with technical expertise of the Author, finally establishing the total validity of this work. Please do not confuse or compare this technique with anything else being taught in the world today. This work stands on its own. 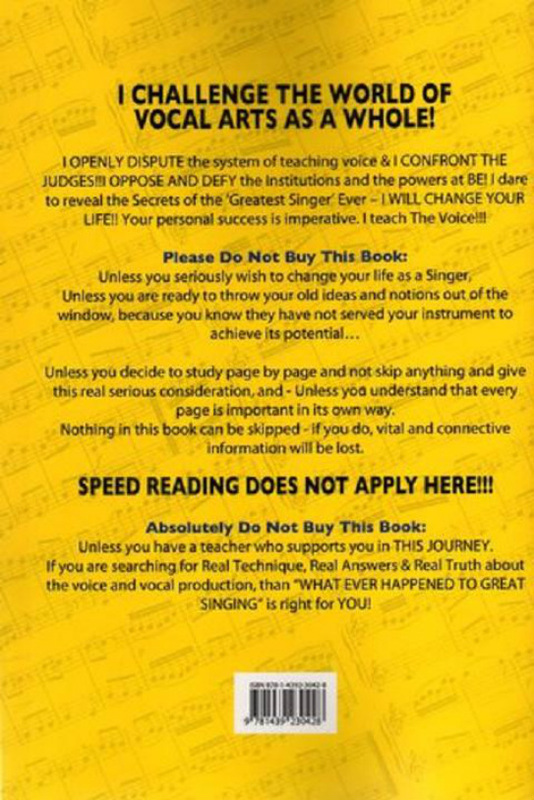 The Author challenges the World of Vocal Arts and any Voice Teacher/ Voice Institution/Speech/Voice Therapist, Coach and is willing to go anywhere, anytime to prove the effectiveness of this work beyond a shadow of a doubt.